Get started as a certified diver! Short on time but want to become a certified scuba diver? The PADI Scuba Diver course is perfect for you. The PADI Scuba Diver course is a subset of the PADI Open Water Diver course, especially for folks who don’t have the time to complete the full PADI Open Water Diver course. If you’re taking your Discover Scuba Dive with The Dive Bus this vacation, you could be a PADI Scuba Diver in as little as one additional day. To enroll in a PADI Scuba Diver course (or Junior Scuba Diver course), you must be 10 years old or older, with adequate swimming skills and in good physical health. No previous scuba diving experience is necessary. The first three of the five Knowledge Development sections of the Open Water Diver course,to understand basic principles of scuba diving. 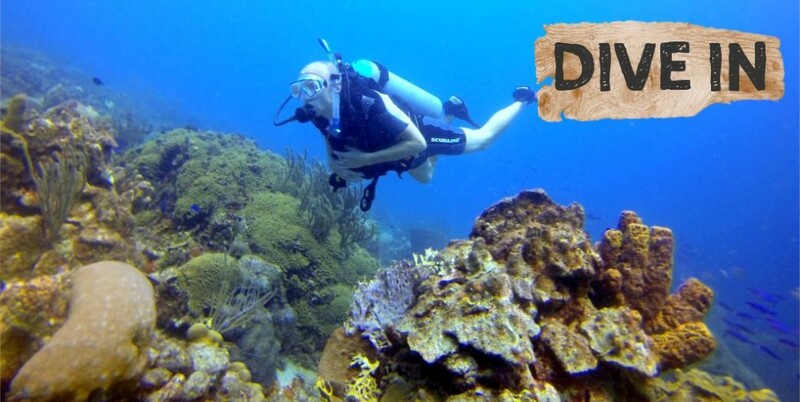 Choose to:- Do it online back home, with the PADI eLearning system or - Do it on whilst you’re here in sunny Curacao: watch the video / self-study the first three sections of the Open Water manual, then review it all with your Dive Bus instructor. The first three of the five Confined Water Dives, to learn your basic scuba skills. You'll learn these in the protected shallow area of the bay, before heading out to the reef for your Open Water dives.If you already did your Discover Scuba Dive with The Dive Bus, you’ve already completed one of these sessions. The first two of the four Open Water Dives of the Open Water Diver course, where you’ll practice your new-found basic scuba skills again, whilst enjoying the stunning underwater world of Curacao on the beautiful Dive Bus reef.If you already did your Discover Scuba Dive with The Dive Bus, you already completed one of these Open Water dives. 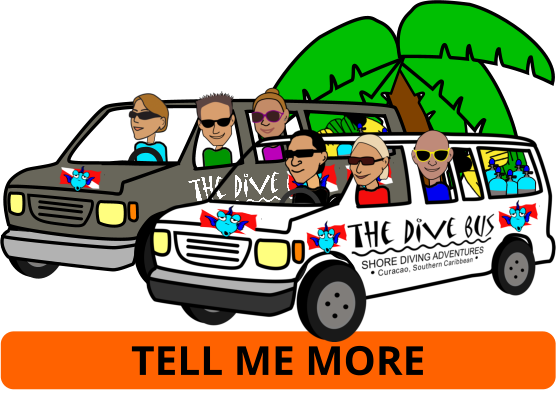 One and a half days with your Dive Bus instructor and some self-study in your own time. If you already did your Discover Scuba Dive with The Dive Bus, there’s only one more day to go! Or you can start learning NOW and save your valuable vacation time… see next tab, below. PADI eLearning Open Water Diver Online. This web-based learning system gives you the background information you need to dive safely, and enables you to study at your own pace through an easy-to-use, interactive program. You only need to complete the first three sections for your PADI Scuba Diver certification. If you decide to continue on to your PADI Open Water Diver certification, you have access to PADI eLearning for 12 months so you can complete the rest of the program. Open Water Diver TouchTM (a tablet app). Watch, listen, read, scroll, tap and interact while you learn to scuba dive with PADI Open Water Diver TouchTM. It’s fun, it’s easy, it’s portable and unlike the PADI eLearning system, you don’t need to be online to use it, so you can truly learn anytime, anywhere.The TouchTM integrates the PADI Open Water Diver Manual with the PADI Open Water Diver Video into a powerful, tablet-based learning experience. When you dive in with the TouchTM, you’ll: - Learn diving facts, principles and safety concepts in preparation for your confined and open water dives. - Watch video clips that show you the world of scuba diving. - Take simple quizzes to make sure you understand the material as you progress. The Open Water Diver Manual. Swing by The Dive Bus as soon as you get to sunny Curacao – the Open Water Diver Manual and other goodies are in your Crew Pack, which is included in the price of your course. You’re also welcome to borrow the DVD if you prefer to learn by watching than reading.If you can’t wait until you get to Curacao, visit your local PADI dive shop back home to purchase your Open Water Diver Crew Pack.Whichever option you choose, your Dive Bus instructor will review everything with you, to ensure you’re comfortable and ready to go scuba divin’! Dive under the direct supervision of a PADI Professional to a maximum depth of 12 meters/40 feet. As a PADI Scuba Diver, you don't learn about dive planning and the effects of nitrogen so you'll need to be accompanied by a dive professional and keep to your depth limit. In one and a half more days, dive deeper and learn more skills as a certified PADI Open Water Diver.